Welcome to your best waterfall experience ever in Costa Rica. 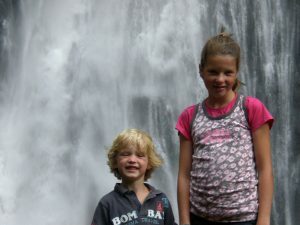 You are going to explore Costa Rica’s biggest and most beautiful waterfall: Second to None in Beauty and Splendor. 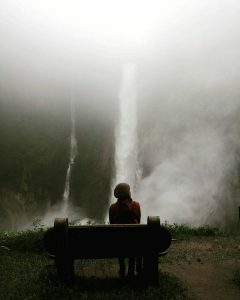 The waterfall has a natural setting, so beautiful that no person could have designed it. We invite you to come over and explore this rough diamond by yourself. First of all park your car safe and secure and buy your entrance tickets and use the restrooms. Probably you are already pleasantly surprised by the number of hummingbirds circling in the restaurant. If needed you can get some cold drinking water and get ready to explore. It takes only a few steps down for the first view of the crater and waterfall. It takes only those few steps for the first big ‘WOW’. 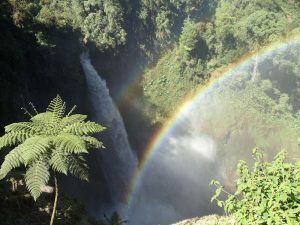 Walk along side the fence to spot the waterfall and crater from some different angles. Also, there is some seating where you can enjoy amazing views in peace and experience the beauty of the place. Alone or together! After the first impression it is time to start exploring. Walk through the primary forest trail, where you will encounter some nice trees. And from where you can see the waterfall from different angles. And they all have their own beauty. Keep walking until reaching the concrete steps, take a deep breath and start descending. Suppose to be there are 182 concrete steps to go, after those concrete ones you make a left turn. Well at this turn if you listen well you can hear another waterfall tumbling. However, unfortunately, for safety reasons unreachable, at least for now. Keep following the trail up and down. Look up once and a while to see nice rock formations. Step by step the rough diamond reveals its beauty to you. Encountering some more seating areas with their amazing views you will finally reach the bottom. The place where you will experience the majesty of the waterfall tumbling down in an ancient volcanic crater. Here you can experience also the special chemical composition of the water. You will feel it in your eyes. And you can see it at the vegetation which looks like somebody burned it. Look around, walk around and enjoy. Definitely one of the best waterfalls in Costa Rica. See what other say about us at TripAdvisor. We have tried to explain in words, videos and photos, the extraordinary beauty of our place. But that is always a bit difficult to do correct. So, the only way to fully understand what we are trying to communicate is to go down the steps yourself. As they say: you have to live it! Costa Rica’s best waterfall is awaiting you.